I can't believe today is my last day in the first trimester! It has went by so incredibly fast. I'm already a third of the way through my pregnancy! Above is my first progression picture- I officially have a tiny bump. Total weight gain? I estimate about 5 pounds. I like to think it's muscle weight since I started back into an exercise routine when I found out I was pregnant. Maternity clothes? I've bought them so that I'll be prepared whenever I 'pop.' I've tried wearing the jeans since I've been so bloated, but they stretch too much throughout the day and my lack of an actual baby-belly results in them falling. I'm looking forward to growing into them though! Stretch marks? No. Hoping that I don't get them once my belly actually starts growing. I've been trying to stay moisturized, but it's so easy to forget while rushing around in the morning! Oops..
Sleep? Fatigue is one of my few complaints. I had a strict bedtime of 8:30/9:00 pm for the majority of the first trimester. It takes a lot of energy people! I've unfortunately been waking up every night to pee since I was about five weeks or so. Luckily, I've been sleeping great aside from that. Best moment this trimester? I have several. 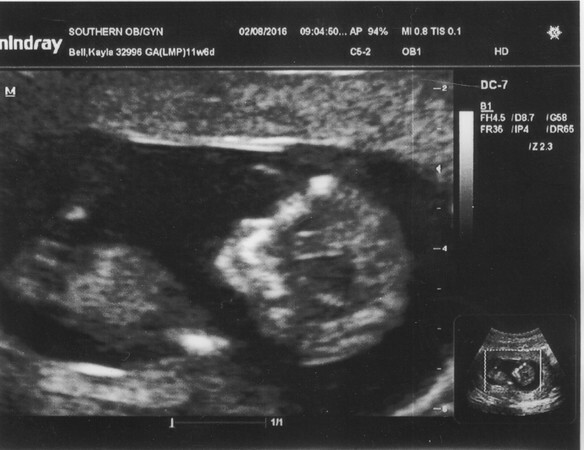 Finding out I was pregnant, announcing to our family & friends, announcing on social media, hearing baby's heartbeat for the first time, AND seeing baby bounce around at our most recent ultrasound- along with seeing baby's sweet face for the first time. Oh- and of course noticing I officially have a tiny bump. 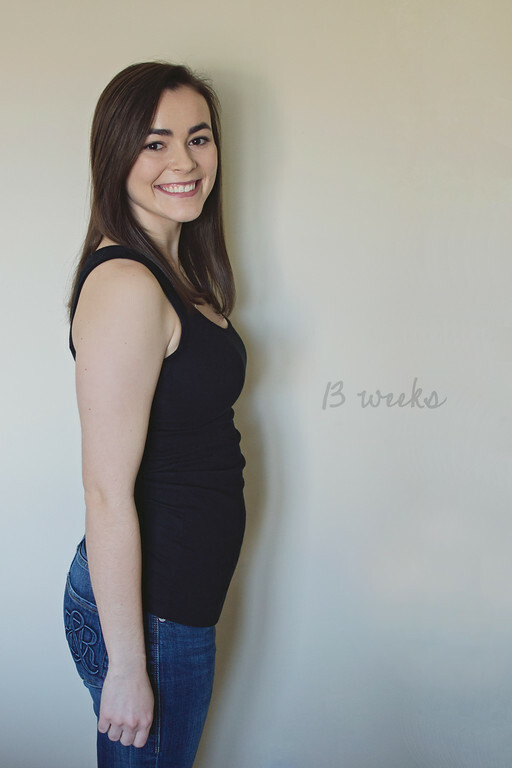 Such an exciting thirteen weeks! Too hard to pick just one. Miss anything? Having absolutely no worries financially. We could do/spend as we wished. Saving money for baby is totally worth it though! Movement? The other night I was laying on the left side of my stomach, and I swear I felt something moving! Zach said he felt the same thing, but on my right side while I was sleeping last night. I think it's because the side we felt it on was pressed into the mattress from the way I was laying down. So exciting! Food cravings? KIWI, KIWI, KIWI. I could live off kiwi. Definitely loving everything salty as well. Rarely craving anything sweet. Anything making you queasy or sick? Nope! I've had the absolute easiest first trimester ever. No nausea whatsoever! Have you started to show yet? See tiny baby bump in picture above! Happy or moody most of the time? I plead the fifth. Definitely happy and not just moody though! Looking forward to? Finding out baby's gender- and of course hearing that precious heartbeat again.